Built in 21pcs LED lights,which is intelligent to OFF/ON brightness by touch sensor switch.You can make up you in poorly light, without disturbing others. Made from premium flame retardant ABS material and mirror glass,perfect looking and resistance for scratch. 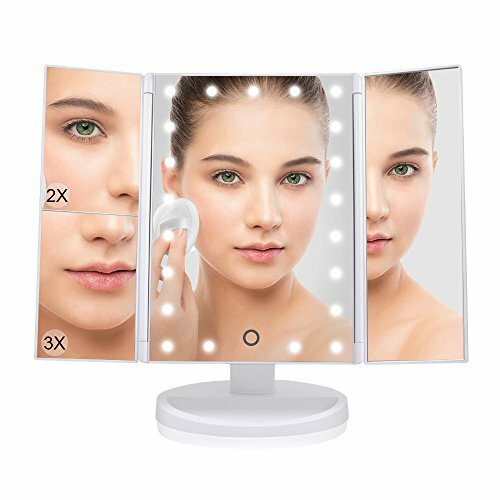 Lighted makeup mirror is designed specially with 4 upgraded LED strap lights, natural daylight brightness. which is intelligent to OFF/ON by touch sensor switch, and adjustable the lights for long press the touch sensor. You can makeup you in the poorly light space, without disturbing others. Made from premium ABS material and glass mirror,perfect looking and resistance for scratch. 2.Three panel and trifold design with 1X/2X/3X Magnification provides wide-angle viewing. Open or fold it like a book when not using to protect it away from the dust or scratches. 3.180 degree Rotation: fix at any position to give you the perfect viewing angle. Base recess can hold jewelry or cosmetics, watch, earrings, bracelets, etc. 5.Due to the Amazon repository receiving problems, now 21LED and 24LED are mixed and will be sent randomly. 100% SATISFACTION GUARANTEE: you can have peace of mind. If for any reason you're not completely happy with your purchase- if it breaks, if it's damaged in shipping, or even if you change your mind - simply let us know and we will either replace it or refund your money, your choice! **Buy 1 get 1 free Deals: Use the code WIGGRIP1888 to get a free Wig Grip(ASIN:B07L97YCXT) at checkout! 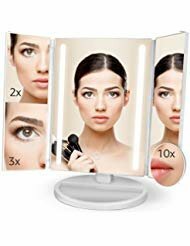 ** MAGNIFICATION: 3-panels with 1x, 2x and 3x magnification so you can easily see the finer details of your face when applying makeup or taking care of your skin. Great for applying eyeliner, false lashes, grooming brows and delicate skin care. Perfect birthday gifts for women, so that they can enjoy a perfect makeup with every detail taken care of. 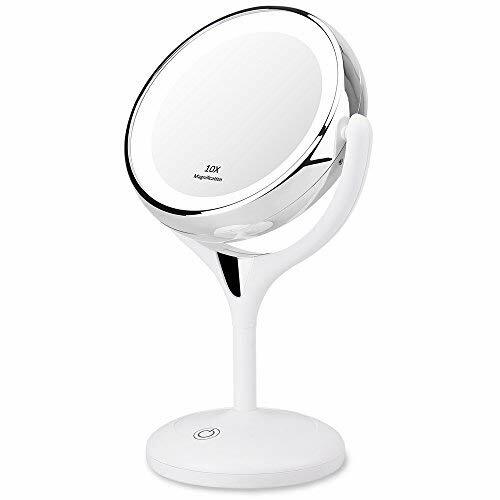 ADJUSTABLE LED BRIGHTNESS: This LED makeup mirror is integrated with 21 energy-saving LED bulbs. 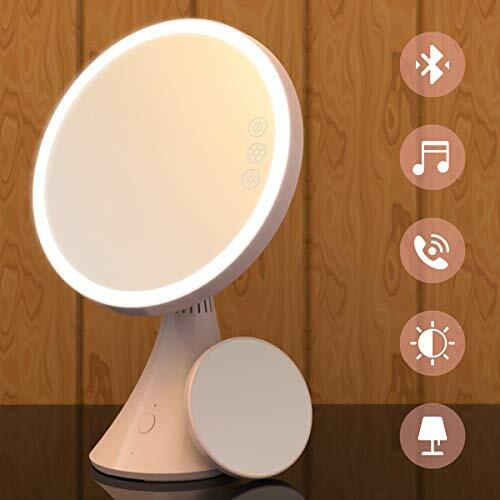 So even in dark enviroment, this makeup mirror with lights can be used as normal and the brightness can be adjusted easily by pressing the sensor switch. 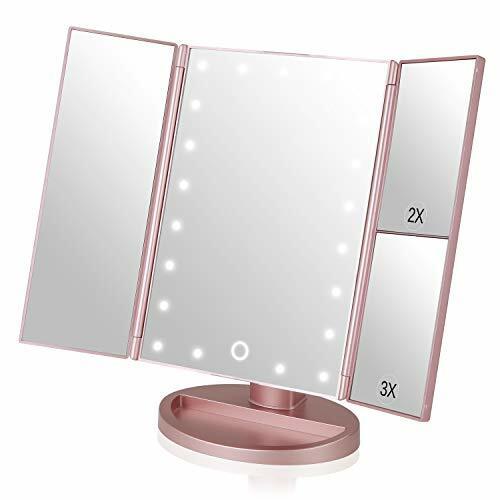 COMPACT TRI-FOLD DESIGN: With the 3 fold design and the rotatable stand, this portable makeup mirror is easy to be carried around and set up anywhere at anytime. 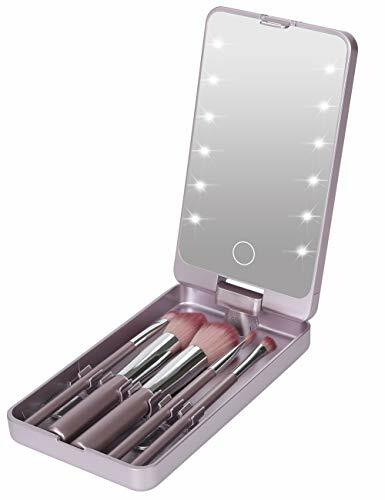 It is also a perfect choice of travel makeup mirror for you. 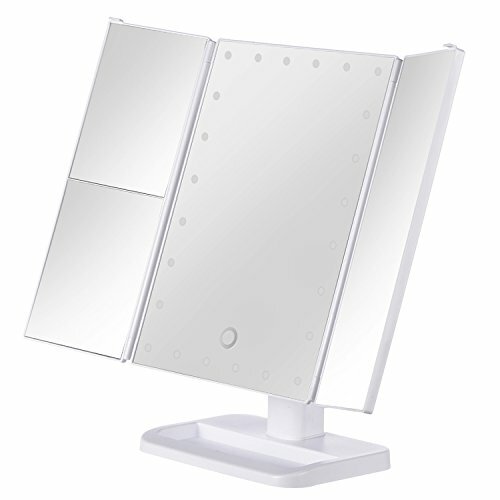 With the 90-degree rotatable stand, this vanity mirror with lights can be easily adjusted to a perfect and comfortable viewing angle for you. 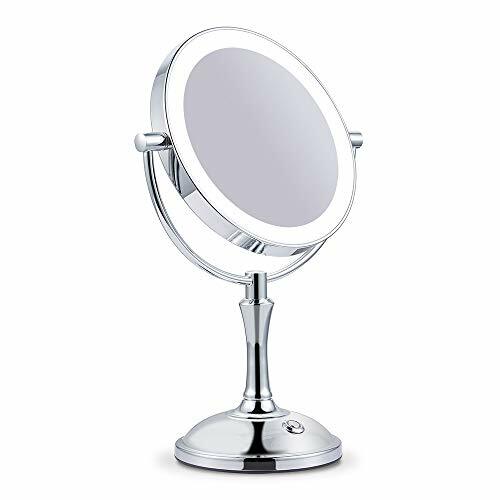 DUAL POWER SUPPLY: This lighted vanity mirror is either powered by 4 pcs AAA batteries (not included) or USB cord (USB cord included). 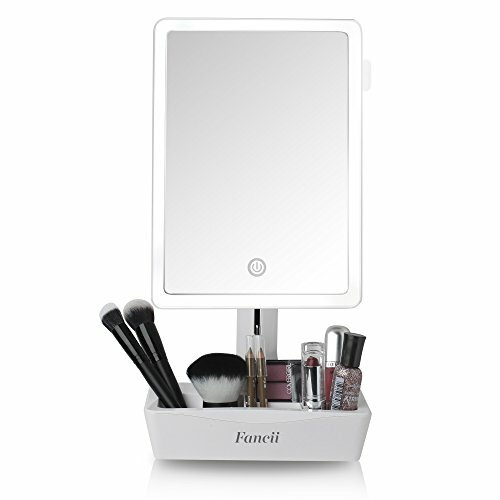 Please note the mirror does not have battery inside and therefore cannot store power itself. 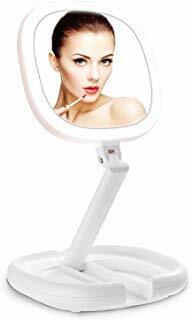 BUY WITH CONFIDENCE: The MelodySusie led cosmetic mirror comes with lifetime warranty. We offer customers a replacement warranty and money back guarantee! If you're not satisfied for any reason, you can get a hassle-free refund or replacement. Contact us to get support within 24 hours. 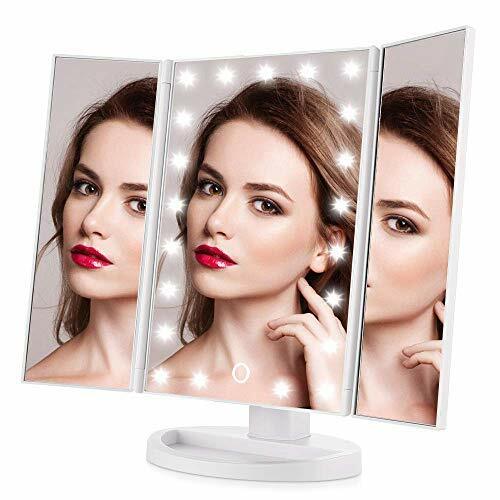 LEDs Strips All-around: Ehomi lighted makeup mirror built in 36pcs bright LEDs, Upgraded 4 LED Tap-lights Design, An improvement over the 21 or 24 less LEDs offered in similar products, clearly reflect every impeccable look, and touching on the sensor bottom of the mirror allows for easy changing the brightness as well as turning the light off and on . Dual Power Supply: Power can be provided by either USB Cord or 4 AAA battery. A 1.5m USB cable is included which is longer than other sellers. (Battery not included). 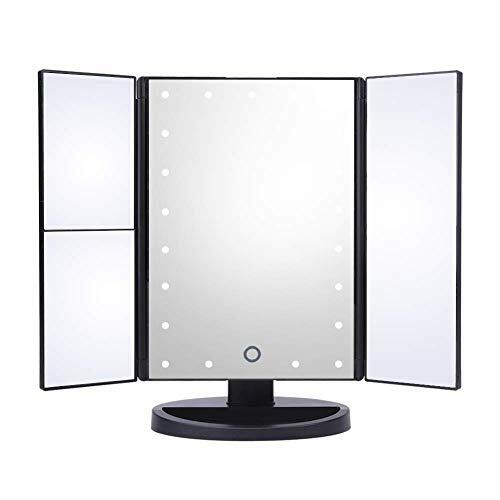 10X 3X 2X 1X Magnifications: Multiple levels of amplifications Light Up Mirror provide precise makeup applications on the eyes, lips, cheeks and other facial treatments much easier. 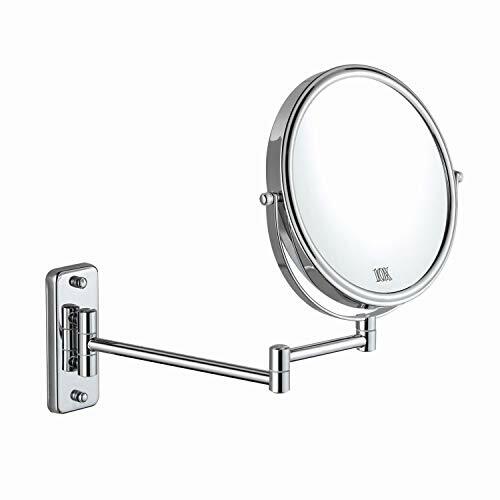 With 2X and 3X magnifying mirror on the left side offers an wide-angle and ultra clear view. 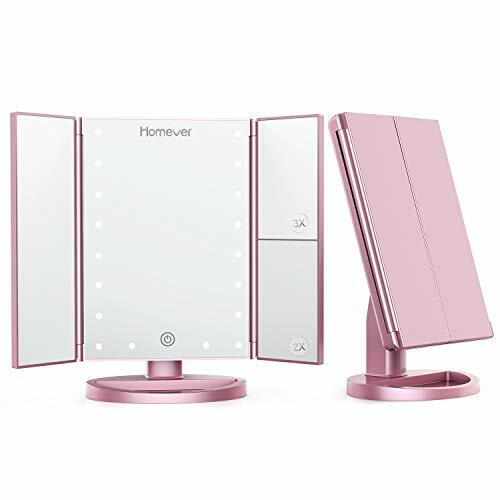 180° Swivel Rotatable: 3 Foldable panels featuring a 180° rotatable base help present your beauty from any perspective and see every minor detail up-close. 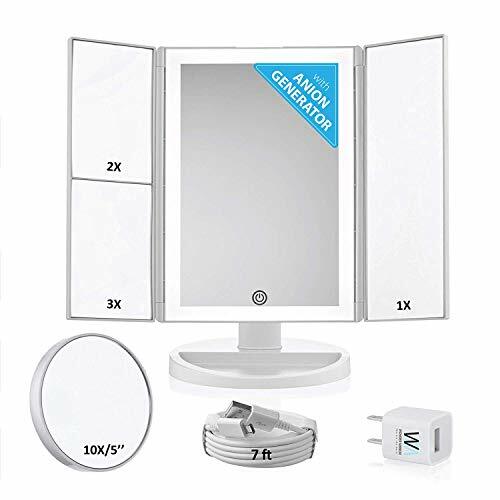 A Complete Beautiful Set: Contains 1 x Black Tri-Fold Mirror, 1 x 10X Magnification Spot Mirror, 1 x 1.5M Micro USB Charging Cable, 1 x Installation Guide covered by a 90 days money back. ADJUSTABLE BRIGHTNESS: built-in 21 PCS LED Bulbs, which it is safe to eyes and adjustable of the brightness by LONG PRESSING sensor switch. You can make up you in poorly light, without disturbing others. 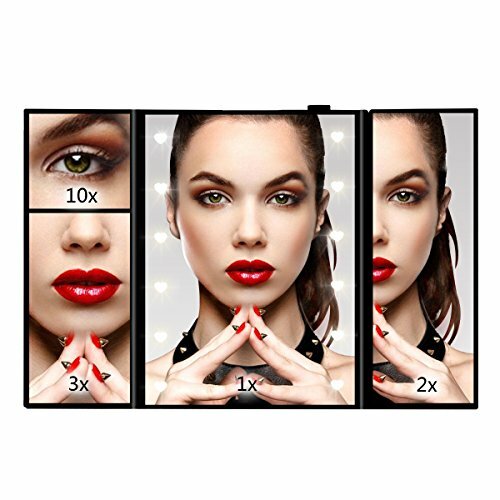 4 PANELS: 1X flat mirror with 2X 3X and 10X magnification spot design, makes sure every detail of your hair and makeup perfectly in place, especially working well for eyeliner, eyebrows , etc. The 10X Magnification is some other sellers didn't have. 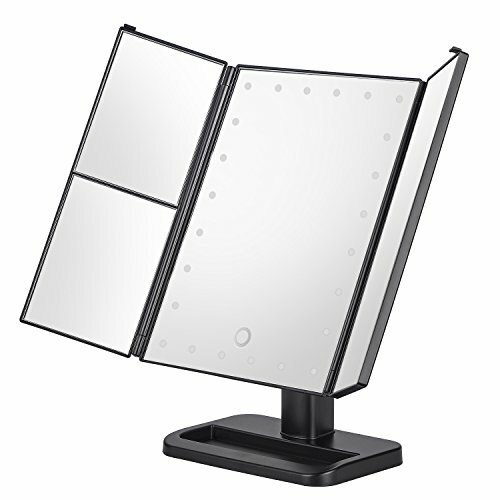 180°ROTATION & TRI FOLDED: Can be fixed at any position to give you the perfect viewing angle; with triple folded and base design, enables you to store up and carry on at any time any place. 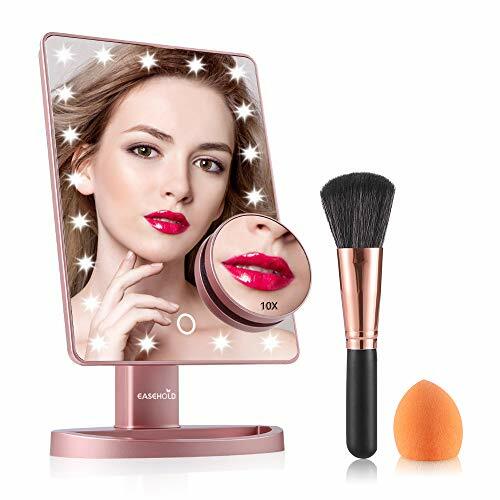 ECO-FRIENDLY MATERIALS: Magicfly makeup mirror adopts eco-friendly thickened ABS plastic with UV coating to ensure a nice look, light weight and resistance to scratch, chemicals, heat, finger prints and safe usage for everyone who likes beauty and personal care. DUAL POWER SUPPLY: Operated by Micro USB cable supply or 4AAA batteries( battery not included, usb wire included) , pls noted the mirror can't store power by itself. 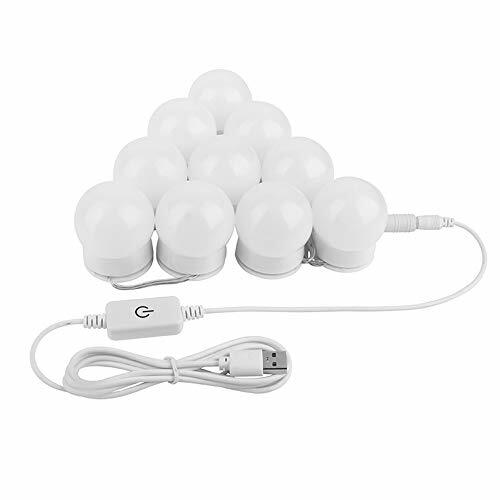 ADJUSTABLE BRIGHTNESS: built-in 21 PCS LED Bulbs, which it is safe to eyes and adjustable of the brightness by LONG PRESS the sensor switch.You can make up you in poorly light, without disturbing others. 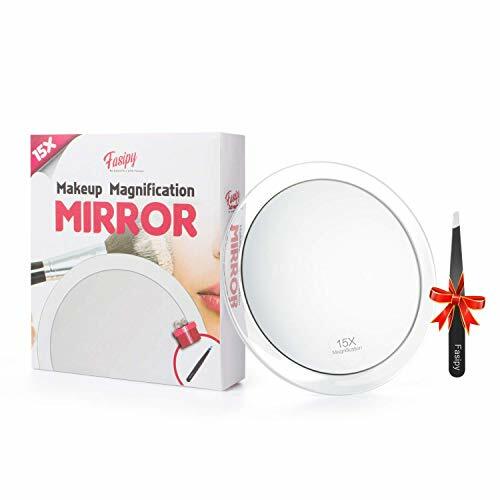 Double Sided Magnifying Mirror - 10x Magnification make sure every detail for make up and shaving. Another 1x side, you can see the image clear in normal distance. 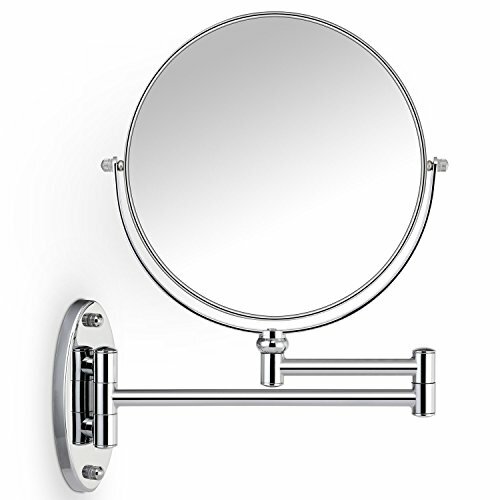 Space-Saving for Your Rooms - Wall makeup mirror with 8 inch diameter, 12 inch extension arm. It is good ideal for bedroom or bathroom with limited space. 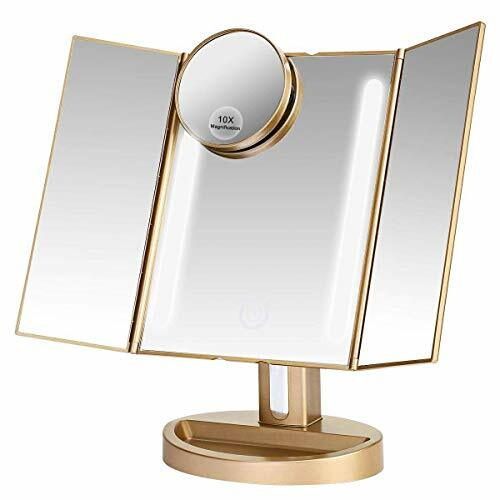 360° Extension Chrome Finish Mirror - Spin the mirror to meet the best angle for different makeup needs. Easy to Install - Suit for bedroom, bathroom, vanity table, hotel and spas. 100% Satisfaction Warranty - Happy purchasing experience is our priority. Totally risk free. 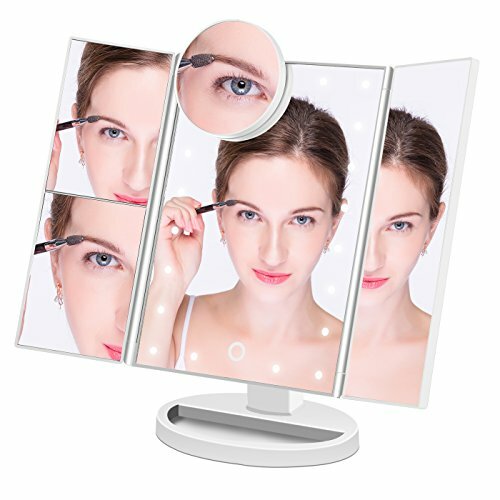 【Ultra-high material】--The vanity mirror make of 3 main parts: the first is High-definition float silver mirror, which has the characteristics of pure imaging, high reflectivity, good color reproduction, and beautiful and natural image; The second is made of environmentally friendly ABS plastic, which is matte finished, scratch resistant and non-slip; The third is the High quality lamp beads, with durability , stable quality, which is high light but not dazzling. 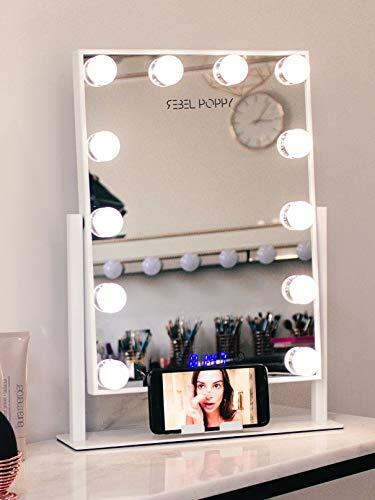 【Magnifying Vanity Mirror with lights】-- The 12pcs built-in Led lights can Illuminate your beauty in dark or poorly lit areas, providing maximum brightness with minimal power consumption(If not using frequently,it can be using for almost year). 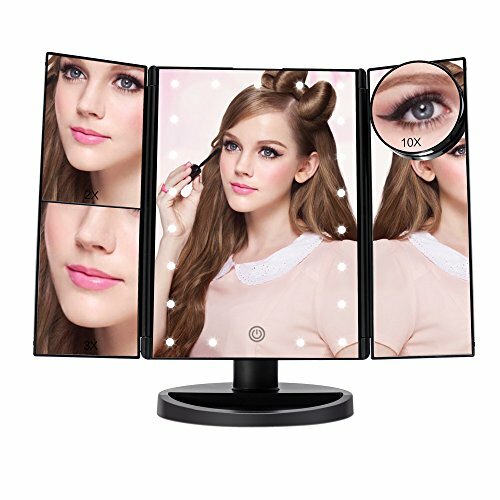 3 Panel provide a 2X/3X/10X magnifying viewing for you to see clearly your facial features and make a more perfect makeup with each detail taken care of. Perfect gifts for ladies and girls. 【Tri-Fold Design】--Easy to take away and daily maintenance, can open or fold it like a book. when not using, it will be anti-dust and anti-scratches and shatterproof. No risk of suffering from falling apart and breaking. 【Portable】--Size: 6.06*4.8*0.55 inch (154*122*14MM). It is convenient to carry and can be put on your small handbag. 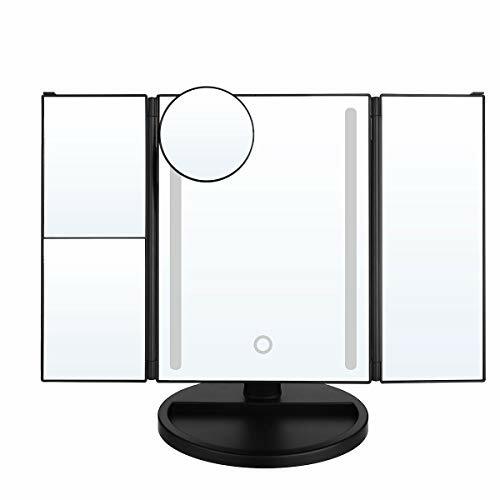 What's more, table top Mirror can stand stably by itself on your countertop. 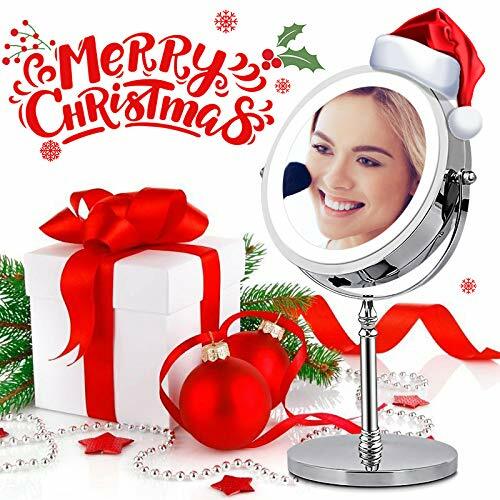 【What you get】--Your package will come with a lighted vanity mirror, 4 piece lithium batteries (CR 2032 3V) , worry-free 18-month, and friendly customer service. 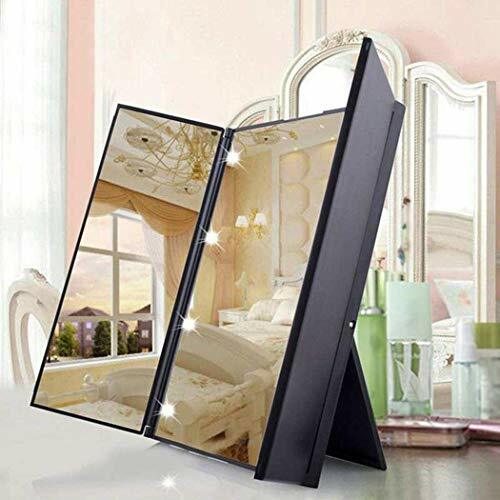 If you are not satisfied with the mirror after you received it, you can have your money back, with no questions asked. Tri-Fold Design :Easy for take away and daily maintenance, can open or fold it like a book when not using to protect it away from the dust or other scratches. 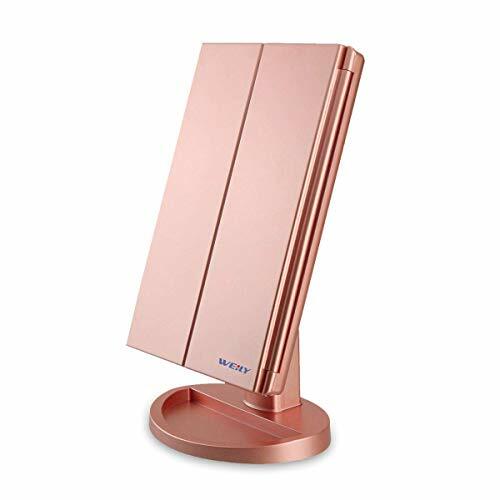 Special crafted Gold Color, quite elegant and sleek appearance. 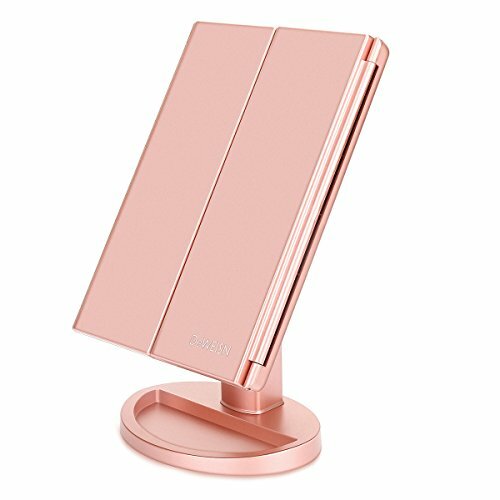 TWO POWER SUPPLY MODE :This lighted mirror is powered by included micro USB charging cord or 4AA batteries(not included). When dual power supply, batteries won't be consumed. Auto shut off after 15 minutes, in case no operations is being done. 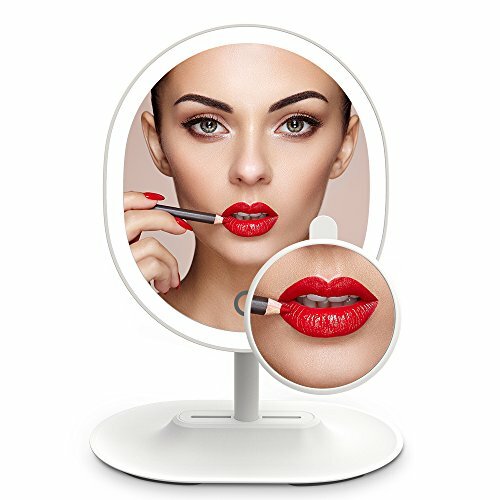 BONUS: Package including a removable 10X magnification suction cup pocket mirror,allows you to focus in on a specific section of your face - ideal for makeup applications and precise tweezing.We offer a 60 days money back guarantee and a 12 month manufacturer's warranty on all of our makeup mirror! 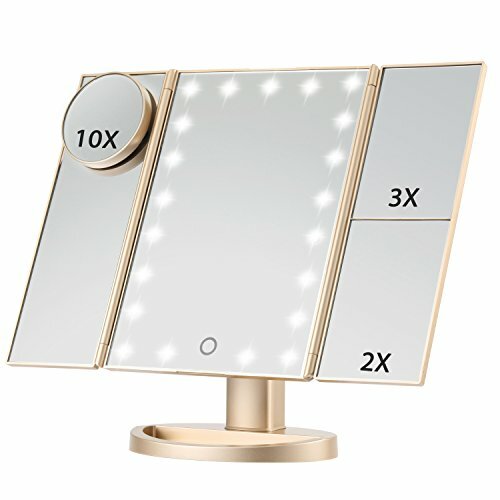 SUPER-BRIGHT SOFT LIGHTING: The MiroPure LED vanity mirror boasts the brightest, most-natural 16-piece LED lighting panel on the market, which provides you with a comfortable environment to apply makeup without subjecting your eyes to glare. 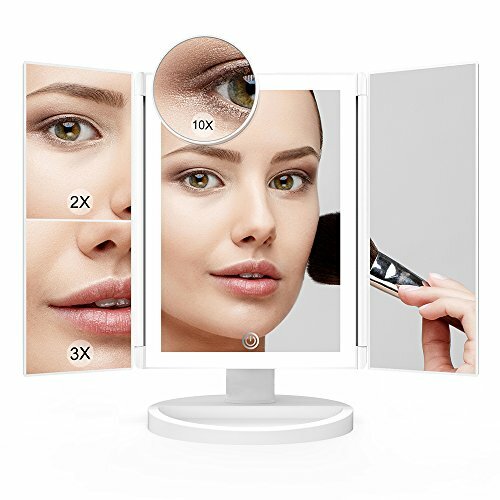 5 X MAGNIFICATION: The magnification makes this mirror ideal for applying make-up and other beauty treatments that require extra precision, such as applying contact lenses and eyebrow tweezing. 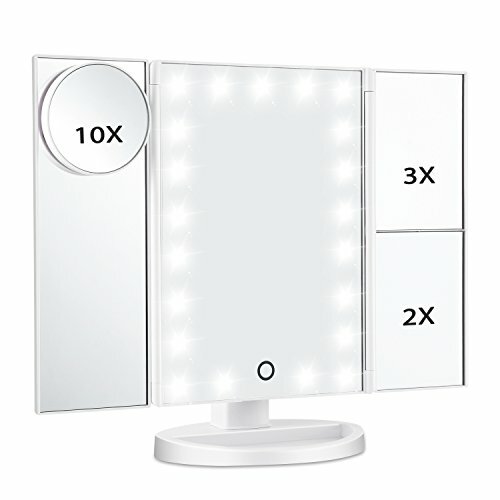 16-LED LIGHT PANEL: The MiroPure vanity mirror has 16 built-in LEDs which allow you to apply makeup in dark or poorly lit rooms. The LED brightness is controlled by a touch sensor; short-press to turn lighting ON/OFF and long-press to adjust the brightness. ADJUST TO ANY ANGLE: The swivel joint allows for easy adjustment of the mirror's face for convenient viewing at any angle. THOUGHTFUL GIFT FOR YOUR LOVED ONES: Instead of an ordinary birthday, Christmas, or anniversary gift, offer your loved ones the gift of empowerment. 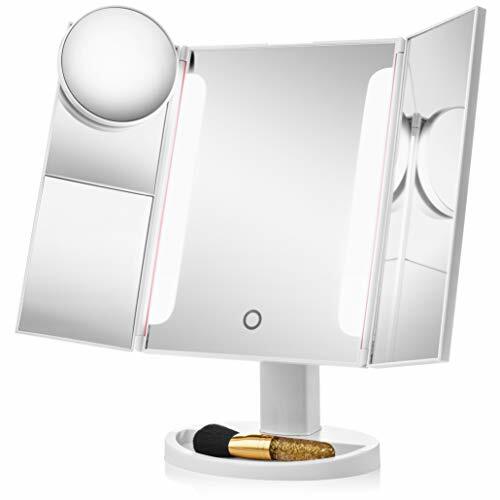 Our makeup mirror serves as a tool to boost one's self-esteem and confidence each time it's used! 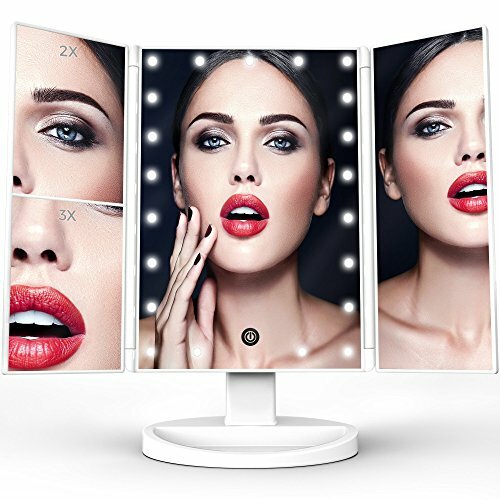 LEPO makeup mirror with 24 LED lights to provide enough light, but definitely not blinding, similar to daylight. You can touch the sensor to adjust the light. 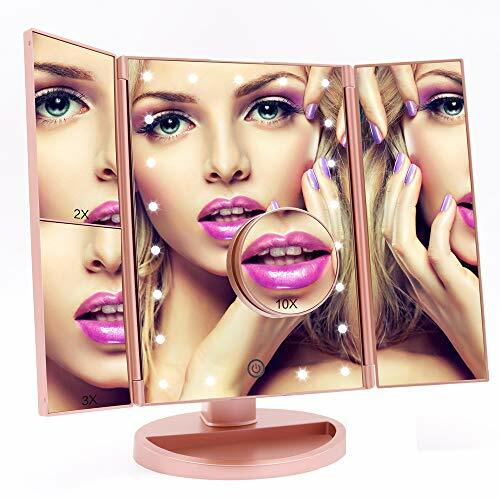 This cosmetic makeup mirror has 1x/2x/3x/10x magnification, and you can see every details on your face to do better when you makeup your face. 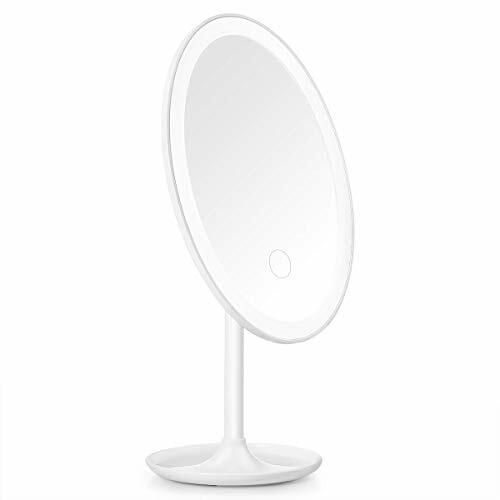 4 AA batteries(not included) or a USB charging cable(included) can be used to power the mirror. 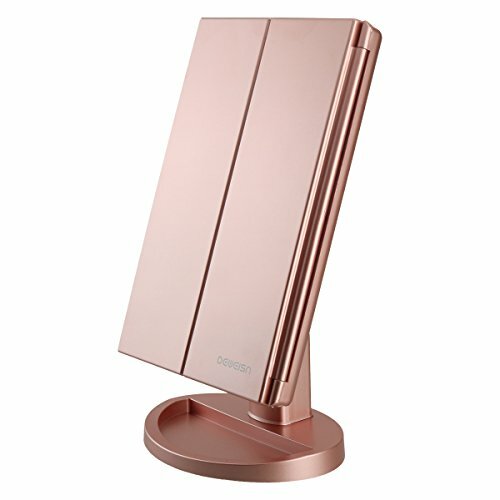 The base of mirror can be used to store little things. 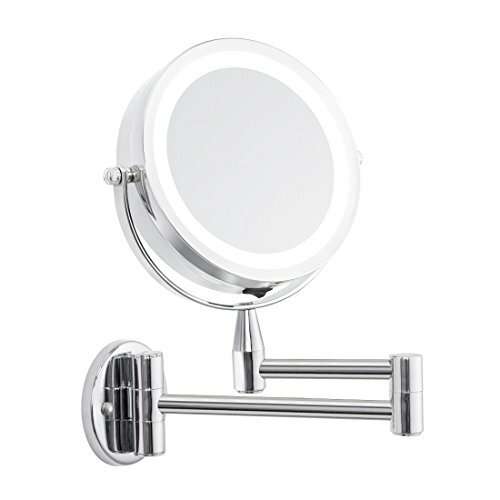 180 Degree adjustable rotation for you to view from different angle, the vanity mirror only can be changed from the upside and down direction but not supported left to right. A great gift for your girlfriend or family member. The beautiful package comes with eyebrow razor and cleaning cloth for gift to help you makeup better. 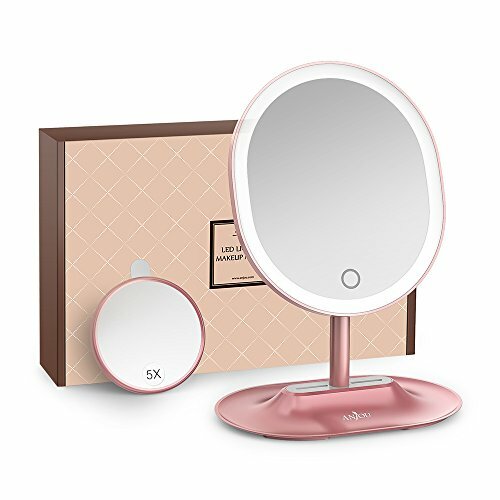 【PREMIUM QUALITY】-- KingKKong Makeup mirror surface is designed with premium quality coating, which turns out to protect the mirror surface. 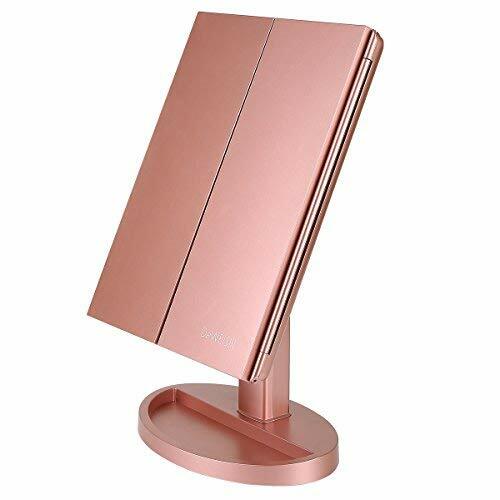 Unlike other cheap products, this high quality mirror is more sleek and polished, ensuring the best experience! 【1X/2X/3X MAGNIFICATION MIRROR】-- 3 panels magnifying and a wide-angle viewing for you to see clearly your facial features and make a more perfect makeup with each detail taken care of. 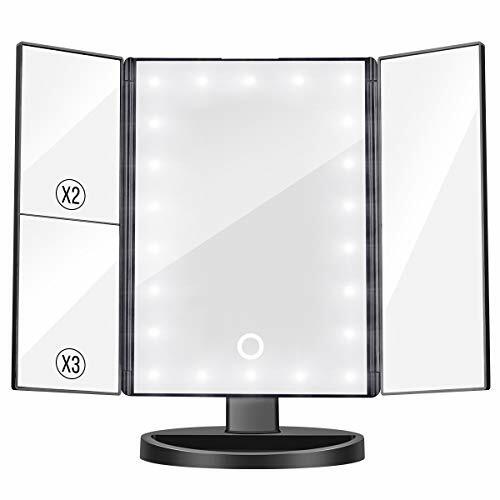 【21 PIECES LED LIGHT】-- Our Vanity mirror is built-in 21 pieces adjustable Leds, allow you makeup in the dark or poorly lit areas. LED lights brightness adjust by the touch sensor switch. 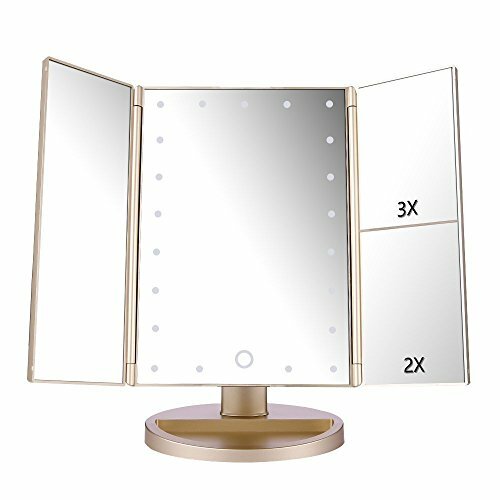 【180-DEGREE FREE ROTATION】-- The lighted makeup mirror stands on your countertop can be freely adjusted and fixed a perfect and comfortable viewing angle. Tri-fold and detachable design makes you can take it anywhere you go. 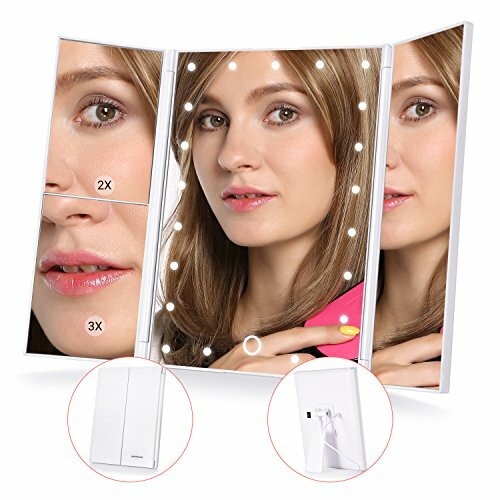 【DUAL POWER SUPPLY】-- This Led mirror can either operated by 4 pcs AAA batteries (not included) or USB cable (included) to make it work, mirror can not store power itself. 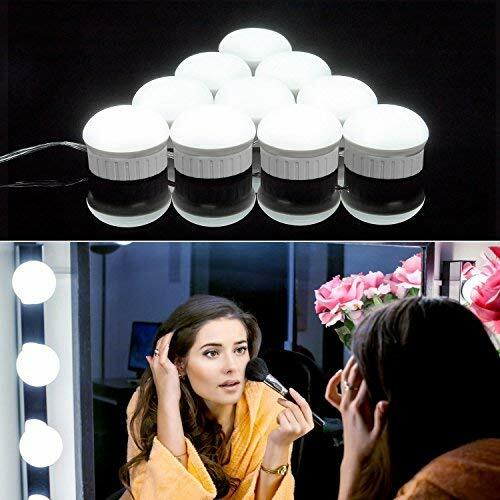 【Vanity Mirror Light】The LED bulb providing a professional lighting for makeup, it is soft and not dazzling, so your eyes not be hurt by the light, the sufficient light makes you not worry about the color difference when make up. 【Adjustable Brightness and Length】Brightness adjustable, you can adjust the brightness to meed your demands. You can adjust the string length between each bulb to match your mirror's size. 【USB Powered】It's powered by USB charger, USB power bank or laptop, so it is convenient when you want to use it. 【Easy to Install】Come with strong adhesion double-sided tapes, the bulbs could be quickly fixed on both glossy and textured surfaces in a few minutes. 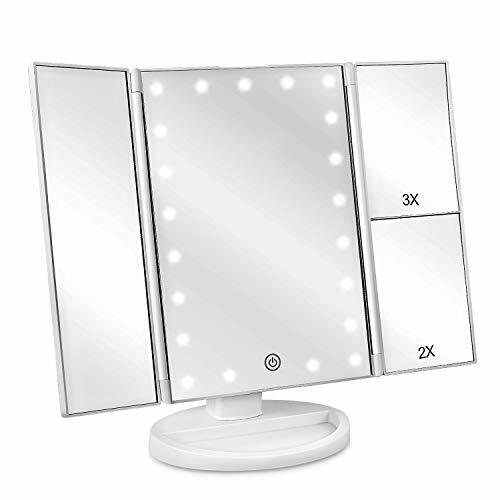 【Wide Use】Multiple uses vanity light can be applied to make-up, fill light, decoration and shooting and so on. Mirror not included.